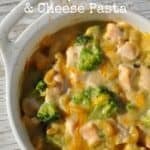 In a large bowl, combine chicken, broccoli, macaroni, and cheese. In a separate bowl, whisk together soup, broth, and garlic powder. Pour wet ingredients into the chicken mixture and stir to combine. Season with salt and pepper, to taste. Transfer to a greased 1 ½ quart baking dish. Stir; bake about 15-20 minutes longer, or until chicken is cooked through and pasta is tender. Let stand for 5 minutes before serving.